For private individuals throughout the UK who want to reach their financial goals, we offer a unique approach to wealth management and financial advisory services. We continually search for better value and choice, and are agile enough to respond to opportunities quickly. As a result, our clients become better informed, confident and empowered to reach their financial goals. Unlike other financial advisory services firms, we take technology further. Through the use of our award-winning systems, we provide our clients with straightforward and transparent advice in a simple and convenient way. We believe that by helping you understand your goals, aspirations and attitude to risk, you become more confident and empowered to take control of your finances. Our mission is to revolutionise wealth management in the UK. Our goals-based approach takes account of your personal goals, timeframes to achieve these goals, and the level of risk you wish to take. We then blend all of this information to create your personal strategy and roadmap. By correctly understanding your appetite for risk, we can ensure that the goals you set are realistic and the investment strategies recommended are the most suitable. We determine your risk profile through a number of methods and display these in a way you can understand. We can also analyse the risk profile of your existing products to ensure that they meet your current attitude to risk. If they don’t, we can find more appropriate investments for your needs. Plus, planning for accumulation and drawdown is easy, thanks to our unique True Potential One®, lifestyle planning tool. We believe that the biggest risk our clients face is the risk of not hitting their goals. For us, setting a goal is the single-most important step in creating your financial plan. That’s why your True Potential Partner will take the time to uncover the real reasons why you are saving and investing and produce a plan that meets your needs. You will be able to view your investments and track their progress against your goals on your personal website. Everything will be transparent to you. As one of the UK’s most innovative financial services organisations, we believe that what we are doing has great value and will help revolutionise the way wealth management is delivered to customers for years to come. Modern times call for a modern approach and that’s what we deliver, all in one place. 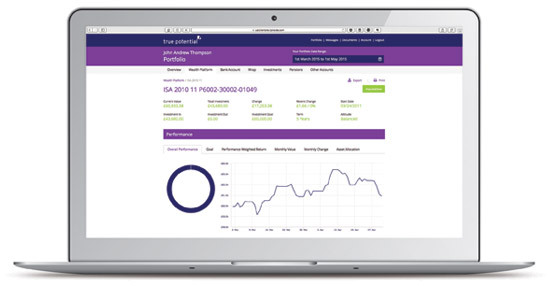 Unique in the UK and exclusive to clients of True Potential, our client sites allow you to view all your investments and bank accounts in one place, whenever and wherever you choose. You can access your client site 24/7 online, or via our range of tablet and smartphone apps. Our True Potential Wealth Management Partners are always happy to talk to you about any aspect of our wealth management process and how they can help you with your personal finances. Best of all, we have financial advisers all over the UK, so you can meet your local True Potential Wealth Management Partner face-to-face. The ‘Beyond Wealth Management’ service is specifically designed for clients wishing to access their financial affairs online. True Potential Wealth Management LLP is authorised and regulated by the Financial Conduct Authority. FRN No. 529810. www.fca.org.uk Registered in England and Wales as a Limited Liability Partnership No. OC356611.